(Newser) – Before a Texas hospital took his pregnant wife off life support Sunday, Erick Munoz asked doctors to do one last sonogram. 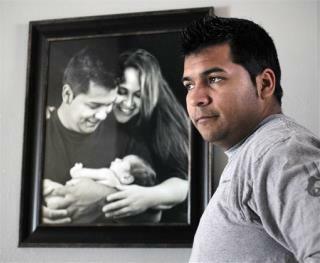 "They think it was a female," Munoz tells the AP of the 23-week-old fetus, his second child with Marlise Munoz. He named the fetus Nicole, Marlise's middle name. Munoz, who sued to have his brain-dead wife removed from life support, had earlier said his training as a paramedic convinced him the fetus would not have had a good quality of life had it been born, having gone without oxygen for hours after Marlise's collapse in November. If that is the husbands name, what is the wife's? I am very glad they finally did what was right in this tragic situation. But how terrible that this young family came to this. His wife dead and now he and his older daughter are left without wife and mother. Very sad, but taking her off life support was the right thing to do.